This may sound like it's come out of left field to most readers here, but the more I learned about podcasting (see the previous post), the more I became intrigued by the idea of spouting off in audio form about all things wine-related. One thing led to another: a tutorial was read, my meager collection of audio equipment was perused, podcast after podcast was downloaded and listened to (mainly from graperadio.com and winecast.net), and ideas began to congeal and combine in my busy little noggin. As of right now I haven't posted any actual audio, but I plan to record tomorrow sometime, and depending whether I can get everything all equalized and finalized I'll probably be posting and making a note here as well. So what does this mean for Brain Squeezings? Well, I will certainly continue to post here. I doubt I'm going to have the free time for more than one podcast per week (though time will tell), but for wine-related posts I may well wind up making intra-podcast posts over at WineFix. Podcasting. For those who may not have heard of it, a podcast is a compressed sound file that a person has put online for download via an RSS reader. Most people create podcasts in order to host their own music or talk-radio shows (responsible podcasters pay a fee to ASCAP and whomever else in order to play copyrighted music), or simply to have a blog that their readers can listen to. I finally got hooked on podcasts by grabbing the first eight episodes of Grape Radio, which is a trio of guys who just talk about wine. They frequently have guests on their show, and it's a well-produced bit of work, complete with bumper music and reading of credits at the end. But podcasts aren't necessarily just for audioblogs and net-cast radio shows: it's not hard to envision a means wherein one's telephone messages are published for your perusal by your phone-service provider on a secure feed, or wherein radio shows publish popular "back-issues" of shows as podcasts (which, I understand, some shows are beginning to do), or indeed any audio information can be made available, TiVo-like, to anyone who wants it. I got a wild hair today, and decided to vacuum, shampoo my carpet, do the dishes and (finally!) 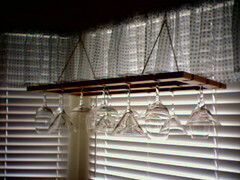 hang the wine glass rack that I brought here from Richmond. This is a moodily lit photo, I admit, but with the blinds open the glasses were actually harder to see. 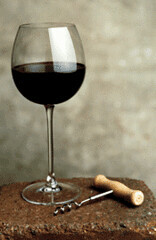 I have to work this afternoon, so I'll just have to get to stabilizing and clarifying the Pinot tomorrow sometime. 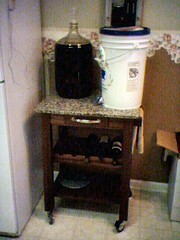 This Saturday will be the Appointed Time to "stabilize" the Pinot I've been fermenting. I'll be stirring a quantity of sulfites (potassium metabisulfite, if I'm not mistaken) into the infant wine to "stabilize" or stop the fermentation by (mostly) killing the yeast. In addition, I'll be adding a gelatin mixture and some dry clay called bentonite to "clarify" the wine, thus causing undesirable compounds (that would make it cloudy and/or taste odd) to precipitate out onto the yeast detritus on the bottom of the carboy. One of the things that I've been fascinated with about the winemaking process is that it's a much more clinical and, well, synthetic-feeling process than brewing beer was. Certainly, brewing incorporates all manner of complicated measures like temperature regulation to maximize the action of certain enzymes in the mash, and siphoning and sparging methods to get the sugar-extraction job done, but that always felt somehow biological and mystical to me, more than chemical and logical, which is the impression winemaking gives so far. The difference is mostly semantics, I know, but making wine has been much more of a predictable, dump-it-into-a-container-and-add-stuff process than beer's bubble-bubble-toil-and-trouble ever was. I know that the yeast is transforming the grape juice just as much as it did the barley brew, but winemaking seems a more clinical and exact thing than brewing. Not that I'm complaining, of course: beermaking involves making an elaborately-seasoned malt sugar solution called wort (which happens to be one of the most biologically "available" media you can make in the home) and then getting only the microorganisms you choose to flourish, and no others. The central difference where wine is concerned is that wine "must" (prepared grape juice, pre-yeast-introduction) is inherently fairly acidic, and therefore inhospitable to many of the nasty-tasting microbes that love to mix things up in beer. 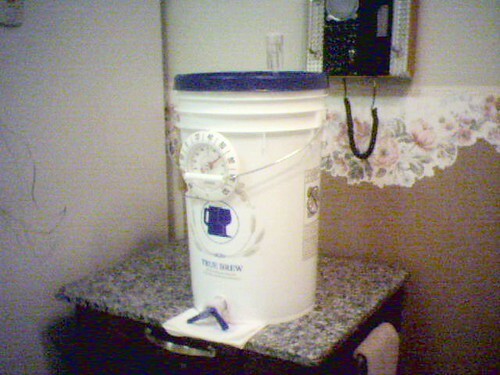 Not that wine is idiot-proof: there are many nasties that can compete with the several flavors of Saccharomyces that one introduces to get fermenting done, but far fewer than in beer, and by judicious use of sulfites in wine, one can make a must that is very well suited only to the yeast you like. Anyway, it's reassuring to know that the process is so well understood (given the several millennia of crushing experience the human species has amassed): winemaking books read more like formulae than do beer brewing's recipes. Might this be due to wine traditionally being more of a luxury product, and thus more likely to receive research attention? Possibly; I'll look into it. One thing I've been meaning to wax poetic about is the beautiful wine table that Leslie got me for Christmas. The picture here is too muddy to do it justice (I'll try for a better one soon), but it's got a beautiful marble top, space for five bottles of wine and some rows of wine glasses, and all sorts of other amenities like locking casters and a drawer for corkscrews and the like. What better place to put my Pinot as it ferments? Thanks to my belated discovery of Flickr and my acquisition last year of a camera phone, I'm planning to put a lot more photos on Brain Squeezings from now on. I don't know if I'm going to be as prolific as Tripp has been, but snapping a picture has been a great way to catalyze a few blog ideas. 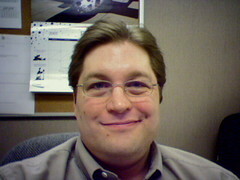 Oh, and this picture might actually be the first one I've posted of me with glasses! Enjoy. 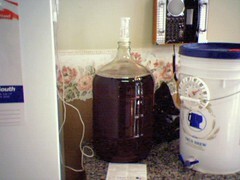 Pinot, Racked into the Carboy. Took the plunge and moved the Pinot Noir into the glass carboy (a big bottle, like those used in water coolers) last night. It smelled fairly odd, but then I've never sniffed a wine in the fermenter before, so I don't really know what's normal. Another odd thing: the specific gravity of the wine (measure of its liquid density, which started at 1.080) was down below 1.000, which means it's less dense than water, and effectively finished fermenting! That was a bit fast; I was expecting it to be around 1.010. I may have to call R.J. Spagnols this evening to see what I should do. 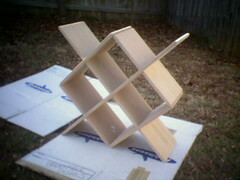 The wine rack takes shape. Leslie and I saw a great "diamond bin" wine rack at an Olive Garden the weekend we attended Tripp's and Trish's wedding. I have a nice arched alcove in my house's living room that until recently served as home to a decent-sized TV, which desperately needed to house something else. A diamond-bin wine rack like this would fit the bill nicely. She and I debated configurations and came up with the configuration here. We grabbed the wood a month or two ago, and this past weekend I enlisted Matt and his Vast Array of Power Tools before the execrable Super Bowl to do some of the beveling, sanding and cutting needed. This photo shows the resulting pieces loosely assembled; imagine it stained a deep reddish walnut and spanning the bottom portion of an archway. It's pretty important that I get some wine storage built, and relatively soon: I have 30 bottles' worth of wine fermenting that I'm going to have to age somewhere! PS. This is my first time using Flickr for a blog photo. Please let me know if anyone has difficulty viewing the picture. It was burbling away at a brisk two pops of the airlock per second this morning. :-) If all goes according to plan the wine may be fermented nearly "dry" (sugar consumed to the limit of the yeasts' ability) by this weekend or early next week, at which point I'll "rack" (transfer via siphon) the wine to a glass secondary "carboy" fermenter to mellow and allow the natural haze to settle. Seems there's been some blowback versus the Stelvin screwcap, mainly because it seems to be somewhat fragile and prone to leakage and/or oxidation when damaged. Here's a long article that articulates some of the problems. Seems innovation's breaking out all over as regards how to bury the humble cork! First, the VinTegra closure (Vino-Lok outside the U.S.) is a new cork alternative that Alcoa's just begun production on. It uses a similar sealing mechanism to the Stelvin closure I mentioned in my previous post, but wrapped around a glass stopper analogous to a decanter plug. It's elegant looking, and offers the benefits of a screwcap without the image problem. It does require a new type of bottle, though (as does the Stelvin). It looks as though there's even going to be a three-level VinTegra product line, with the glass model for the high end, a Stelvin clone for the middle, and a truly ghastly-looking small screwcap for the low end. Then there's the Zork (Wasn't that an Infocom game?). The Zork tries to capture the seal of a screwcap while retaining the "pop" of a cork-style stopper, and by some indications it may be succeeding. It's a funky-looking plastic affair about the size of a champagne cork assembly, with a zip-band that must be torn off before yanking out the synthetic stopper, so attaining the pop in question. The Zork seems fairly new (in any event, I've never seen one), but the Zork website says it's been in development since 1999. I'm not sure it's dignified enough for use with a hifalutin' French red, but for any edgy or trendy label it ought to do wonderfully. Especially if it works as advertised. It will even work with standard still-wine bottles! Natural corks versus alternate closures. It's a poser. The image of a glass bottle sealed with a cylindrical stopper punched from the bark of the Cork Oak tree Quercus suber is iconic; it's what people think of when they think of wine. The "pop" of a cork from a bottle, whether its contents are still or sparkling, is one of the most universally welcoming and celebratory sounds we have that isn't produced by the human larynx. Sadly all is not well in wineland: natural corks, for all the effort we may put into preventing it, are prone to contaminating the wine whose wellbeing was the very reason for their pressure into service. Figures vary widely, I suspect by affiliation with or against the use of natural corks, but I've heard a low of around one percent and a high of ten percent of all wine bottles are "corked," or suffering from "cork taint." I myself have been bitten by cork taint a few times (not nearly one bottle in ten, but far too many times for my comfort). The most recent was this past Friday. The wine wasn't destined to be great in any event, but it was foul, and the cork showed the reason why: dark veins rain through its lower third, and told the nasty-tasting tale. Hardly anyone who has bought a middle-to-low-end bottle in the past few years is unacquainted with one variety or another of synthetic cork, from the often colorful, obviously injection-molded plastic SupremeCorq, to the odd, extruded homage that is Nomacorc with its inner granular cells and outer sealed layer, to the Betacorque (which I have yet to see, or perhaps, yet to notice) which is fully synthetic, but nearly indistinguishable from a good agglomeration of natural cork bits. The jury is still out on whether synthetic corks impart any sort of plastic "notes" to wines over time (I've never noticed, but my palate is young and still learning), and they're known for being slightly more difficult to extract from a bottle than natural corks, and most models are difficult or impossible to reinsert in a bottle after opening. The major benefit they offer outside of protection from cork taint is that they preserve the experience and simple theater of corkscrew extraction: that old squeak-and-pop. Oh, and manmade corks never disintegrate and leave bits in the wine, either. Then there are screwcaps, the sad red-headed stepchild. The sight of a screw-top bottle of wine brings all sorts of associations with it: skid row; a cheap, paper-bag-wrapped, low-quality wine. Which is a shame, since it's becoming clear that a screwtop (the most famous is the Stelvin Closure) may just be the best way truly to seal a bottle of wine. There is some debate about whether allowing some oxygen to pass a bottle's closure is necessary to age a wine properly, but wine experts seem to be coming to the conclusion that wines age perfectly well when isolated from the outside world entirely, citing the examples of fortified wines sealed with wax, and wines retrieved from shipwrecks (article--search for "Closures in practice"). So even though there's a version of the Stelvin that allows some transfer of oxygen, that's likely to be gilding the lily. What I've enjoyed most about learning about this topic is the amazing amount of introspection that the wine industry seems to be undergoing as regards the simple cork. Cork taint seems to be one of those things that has simply been accepted for the vast majority of the cork's life, possibly lending the opening of a bottle a certain element of mystery and risk. With wine maturing into an industry like any other, however, with the requisite drive to provide the consumer with a high-quality, uniformly consistent product, the vagaries of natural corking seem to be tolerated less and less. ...the over-riding business rationale in changing from cork to screwcap is that we could prove that under cork closure, we were UNABLE to deliver on our mission statement [based on wine excellence]. Fistonich has also declared that all of his wineries are now "cork free zones." My guess is that sometime in the next 25 years we're likely to see natural cork relegated to the sidelines, and the landscape will be dominated by screwcaps, followed by a boggling variety of synthetic cork-esque stoppers.